The Earth-Keepers Crystal Vortex Reunion in Hot Springs Resort, Arkansas. Keynote Speaker: Hidden Histories of Egypt, Greece, Ireland, Arizona: Return of the Goddess. Earth-Keepers Colorado Stargate Conference. Embassy Suites, Denver, Colorado. Goddess Retreat for Women, held in Sedona, AZ. At this Retreat you will: Free your Inner Goddess and empower your life. Discover your inner child through your hidden creativity. Clarify your soul intent and alignment with deeper Truths. Participate in a New Moon Birthing Ceremony. Laugh, play, and bond in our Goddesshood. The Egypt ~ Ireland ~ Arizona Connection, held in Sedona, AZ, March 7, 2015. Why did the Vatican want to wipe out true Irish history? What was the truth behind Akhenaten’s ‘only one god’ reign? What don’t we know about Arizona’s (and Sedona’s) connection to the Egyptians? As the veils are being lifted on all major aspects of our financial, political, and religious lives and beliefs, our hidden history is also being radically revealed. New discoveries, old mysteries, experiential insights, past life rememberings, and channeled information all combine to reveal the amazing truth about our ancient ancestors and their advanced technologies. WORDS, SPEECH, AND VOICE: MODERN KEYS TO THE EMERALD TABLETS OF THOTH THE ATLANTEAN AND THE SECRET OF ALCHEMIST GOLD, held in Village of Oak Creek, AZ, November 7, 2014. Legends say the Tablets “fell from Heaven” eons ago. Myths say Thoth brought them from Atlantis to Egypt. Ancient stories tell how they were used in the Isis Mystery Schools as guides into past and future timelines. Wherever the Truth lies, their wisdom can be used today as a handbook for the Golden Age. Let’s explore these Keys to our hidden Codes of Memory and empower ourselves into True Freedom. Join us in a lively discussion that combines ancient and modern methods of spiritual growth. 6:00 - 8:00 pm at Sherpa Spirit. A MESSAGE FROM MARY MAGDELENE, held in Sedona, AZ, October 4, 2014. This is an expanded and more personalized version presented at the Magdalene Conference in July. 9:00am - noon in the Sanctuary Room, Sedona Unity Church. MARY MAGDELENE CELEBRATION, held in Sedona, AZ, July 26, 2014. Jeri's presentation is "Beyond the daVinci Code: Implications of Archeological Revelations", with power point. 2:00 - 3:00 pm in the Great Room, Sedona Creative Life Center. EARTH-KEEPER AZ STARGATE GATHERING, May 23 - 26, in Scottsdale and Sedona, AZ. Jeri will be a featured speaker at this event located at the beautiful FireSky Resort in Scottsdale. MASTERY GAME BOARD PLAYSHOP with power point. April 5, 9:30 - noon at Unity Church in Sedona. Magdalene Gathering at Unity Church in Sedona. MASTERY GAME BOARD PLAYSHOPS at Sherpa Spirit in Sedona, AZ. February 21, 4-5:30, and March 9, 3-4:30. Play the Game of the Masters as played in Atlantis and Egypt in the Isis Mystery Schools. CONSCIOUS LIFE EXPO, Feb. 7-9 at the Hilton LAX in Los Angeles. Jeri will be on a panel with some amazing women discussing The Emergent Feminine on SUNDAY, FEB. 9, 2:30-4:30. Click on the link for more information on this fascinating conference with world-class speakers, Divine Feminine experts, UFO and cover-up researchers, healers, psychics, astrologers, predictors, and many panels. Ancient teachings join modern times as we explore our love of Gaia, her gifts for us and the healing and joy we wish to bring to her and all her inhabitants. What exists outside our world remains mysterious, but it's increasingly accessible. We'll explore contact, messages and rekindling friendships with our Galactic Family. (928) 284-2218 Click here for details. Under the oaks at the old pumphouse by the Creek, Sedona. May 24-27, 2013. Featured Speaker on " The Divine Feminine and the Gnostic Gospels" at the Earth-Keeper Crystalline Stargate Gathering on the WESAK Full Moon Lunar Eclipse in Scottsdale and Sedona, AZ. Other speakers include James Tyberonn, Graham Hancock and Richard Hoagland. Archangel Metatron calls these dates the most potent energy of 2013. The Full Moon Eclipse will bring in the presence of the Angelic realm and the Ascended Masters when obstacles can be faced and released, prayers manifested, and clarity is enhanced. 12-12-12--The Most Important Date of the Year. 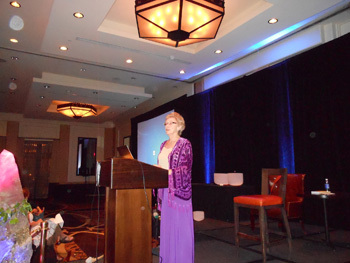 Jeri was a featured speaker at the Crystalline Completion presented by James Tyberonn. Other speakers include Graham Hancock, David Childress, John Major Jenkins, John Van Auken, and MAX, the true extraterrestrial 13th Crystal Skull. December 9-12, Little Rock, Arkansas, site of the largest singular deposit of natural quartz crystal on the planet. The crystals are awakening on 12-12-12 and represent the Return of the Law of One. Arkansas is also the location of the Crystalline Sun Disc. Saturday, November 10. Multimedia Presentation and discussion - THE GODDESS AND THE GAME BOARD -- A Guide to the Golden Age - with Messages from Isis - Jesus - Mary Magdalene - Michael - Thoth - Metatron - Mother Mary - Ra - Osiris. 11am - 12 noon, Sedona Library. July 21, 9-3 pm. Book Signing. Mary Magdalene Celebration at the Sedona Creative Life Center. May 20, 7 pm. Celebrate our Divine Feminine on the Solar Eclipse. April 22, 1-5 pm. Art Demo. Earth Day Celebration. Sedona Community Center. March 11, 10:00 AM. Power Point Presentation. NEW DAWN IN AN OLD LAND: Reflections on a Pilgrim's Journey in Egypt. Church of the Golden Age. Sedona Community Center. March 7, 12:30 - 2:30. Becoming Galactic Humans. Osher Lifelong Learning Institute (OLLI). Yavapai College - Sedona campus. January 14 & 15, 9-5pm. GODDESS RETREAT FOR WOMEN in the beautiful red rocks of Sedona. Free your Inner Goddess and empower your life. L.A. LIFE MAGAZINE-"Treatment of Mental Patients with Christ Complexes and Religious Delusions." NAPA VALLEY REGISTER-"Women and Personal Mythology." PRESCOTT COURIER-"Paint the Sky and Dance." 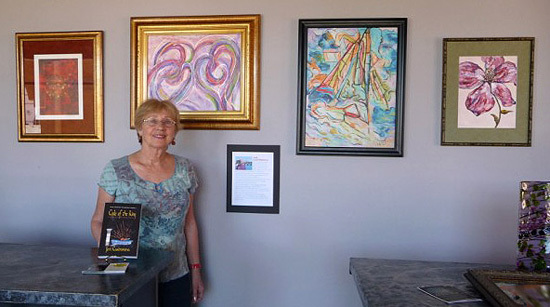 Jeri was the featured artist at a local Sedona gallery.